Over the last decade there has been a large shift in the luxury watch market towards timepieces with big and over sized cases. Many luxury brands such as Panerai, Ulysse Nardin, Breitling and Omega have released collections with cases that measured 44mm diameter or larger. Even Rolex who has a history of making mid sized watches embraced the trend; in 2007 they released the Yacht-Master II with a case that measured 44mm. The Yacht-Master II like many large watches has a thick case that really make it’s presence known and can even make the biggest wrist look small. These large sports watches are great attention getter and suit those who don’t mind having their watch get all the limelight. Now during the past couple of years there has been a steadily growing group of consumers who are pushing for a return to form. This growing segment of the market is purchasing timepieces that mirror the trends of the past, when watches rarely exceeded 37mm. The timepieces of the 50’s and 60’s traded flash for a more subdued beauty; these watches were made to compliment an outfit rather than outshine it. 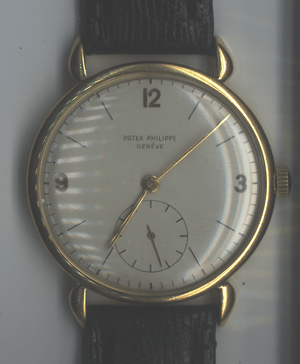 A great example of a classically created watch is the Patek Philippe Calatrava with a 37mm case, a stark, cream colored dial and only a small second sub dial. These type of watches tend to be attached to beautiful brown/black crocodile straps or had a small stainless steel bands. This new trend is so strong that consumers who can’t find a more modern interpretation of the classic wristwatch are actually going out and buying vintage pieces. We here at Raymond Lee Jewelers have a wide verity of vintage timepieces at amazing prices. Watch Sell. Whether you prefer a large or a midsized watch, your watch collection in all honesty should have one of each. I know my last statement will sound like heresy to consumers who are steadfast in their adhere to a certain watch size but it is true. Watches are more than just a reliable way to tell time; they are silent and unique way of expressing something about ourselves to the world. Both watches have their time and place for example a large watch should be worn with a more casual outfit to spice it up. If you are dressing for a date or important social event, large wristwatches are a great option as they tend to attract attention and stands you out from the crowd. A midsized watch on the other hand should be worn at the office especially if you are wearing a suit. These watches lay low on the wrist and tend to only peek from underneath a dress shirt; giving those you work with a brief glimpse of luxury and often leave your coworkers wondering about whats on your wrist. These watches were created to enhance a great suit or tux not overpower it. If you are looking for a watch that is in-between perhaps purchasing a midsized watch that has a rose gold case, this is a great compromise as it catches a lot of attention but still radiates a timeless presence.